Pulse~LINK Inc. reorganized with new management team. New products based on CWave™ technology to be introduced at Consumer Electronics Show (CES) 2013. 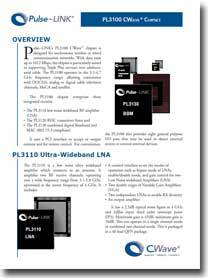 Pulse-LINK’s CWave™ Chipset is result of $100 million investment in research & development. CWave™ only networking technology capable of operating both wired and wirelessly. Expanding markets beyond home entertainment to business, automotive, aviation and military. DECEMBER 06, 2012 – Carlsbad, CA – A reorganized and strengthened Pulse~LINK is ready to re-ignite its growth as one of the most innovative technology companies in the United States. Pulse~LINK is launching its highly rated CWave™ technology; the only chipset in the world capable of operating over both wired and wireless media simultaneously. “Pulse~LINK’s state-of-art CWave™ chipset, at 1.35 Gigabits per second, is the highest performance solution available today for networking digital data over wires or wirelessly,” stated John Santhoff, Founder and Chief Technology Officer. “With over $100 million of research and development invested to develop Pulse~LINK’s CWave™ technology, we are now bringing to market products based on that technology here in the United States and internationally with positive results.” Pulse~LINK will be demonstrating products based on CWave™ technology in Las Vegas at CES 2013 in January. CWave™ enables new capabilities and functionalities never before possible for both wired and wireless applications with a low complexity architecture that enables low cost, small size, low power and high performance. It is based on a groundbreaking approach to UWB communications technology that optimizes its unique attributes to achieve the highest data rates, most robust performance over coaxial cable, and best wireless performance for the unique requirements of wireless HD connections all from a single chipset. 2 Responses to "Pulse Link Restructures Poised To Market CWave™ Chip Technology"
Have you release your CWave for Home technology yet? Pictures on your website would be helpful when writing about new technology. CWave® Pro is available now. We just updated our site and added pictures. Let me know if you have any other questions.